Executive styling perfect for boardroom, meeting room and auditorium. 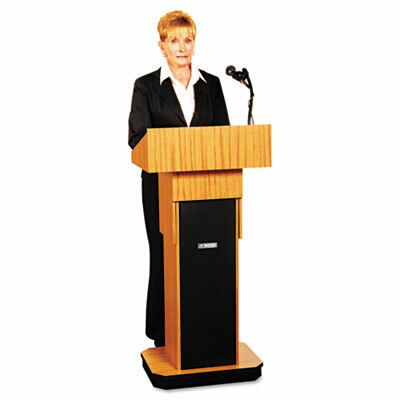 Reaches an audience of up to 1,500 in a room up to 15,000 square feet. One-touch pneumatic dial control for easy height adjustment. Two tilt-and-roll casters let you easily move it wherever you need it. Executive styling great in boardroom, meeting room, auditorium. Wired sound system reaches an audience of up to 1,500. One-touch pneumatic dial control for easy height adjustment. A dynamic gooseneck mic with 15-foot cord for voice clarity. Two tilt-and-roll casters let you easily move it wherever you need it. Runs on ten D batteries or AC adapter or converts to a rechargeable system with AC adapter and NiCad battery pack.